What Causes our Faces to Look Older? The aging process for most parts of the body is irreversible. However, there is one part of the body where the aging process can not only be reversed but actually improve what the patient had 30 years ago. The part of the body that can completely reverse the aging process is the jaw position of the patient and it is done without surgery, quickly and easily - this is known as the Face Lift Dentistry® Treatment. This process is designed to not only correct the bite but go beyond tradition cosmetic dentistry. It is not good enough to just get a better smile. 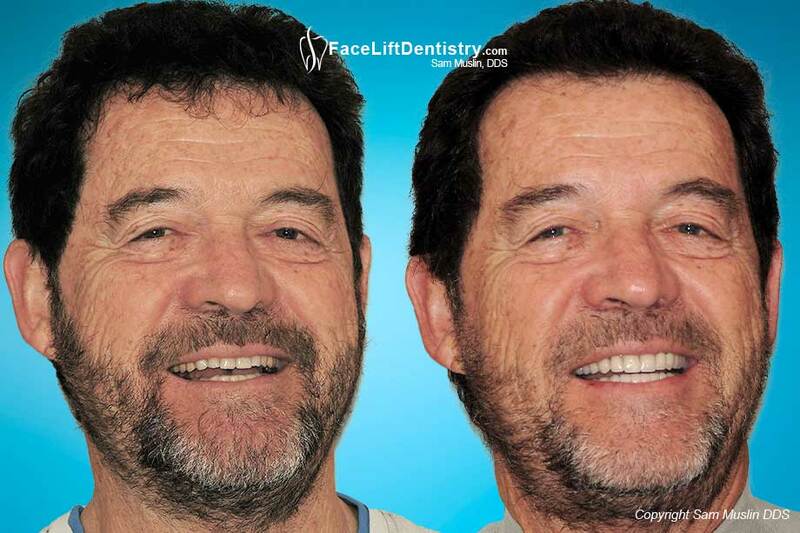 Anti-aging dentistry removed all of his old dental crowns and fillings and replaced them with a matching set of porcelain veneers, porcelain crowns and Dr. Sam Muslin’s trademarked VENLAY® bite correction restorations with Face Lift Dentistry® treatment. The reason is that they generally do not improve your jaw position. They do not improve the shape of your face and they do not improve your health most of the time. In order to get the most advanced treatment, it needs to improve the shape of your face, your facial profile and reduce head and neck tension and stress. Big deal, you spent a fortune with your local dentist getting a complete bite reconstruction and now when you smile you have white teeth. Your jaw looks the same. Your chin still looks small and the proportions of your face did not change because you did not get Face Lift Dentistry®. There is another level of care that has science behind the method that improves the shape of your face while doing all of the things that a normal bite reconstruction achieves. The science behind this method helps you look younger for the rest of your life, which is something your local dentist, may not understand. Consider the consequences of not going the extra mile to give you benefits that could last the rest of your lfie. 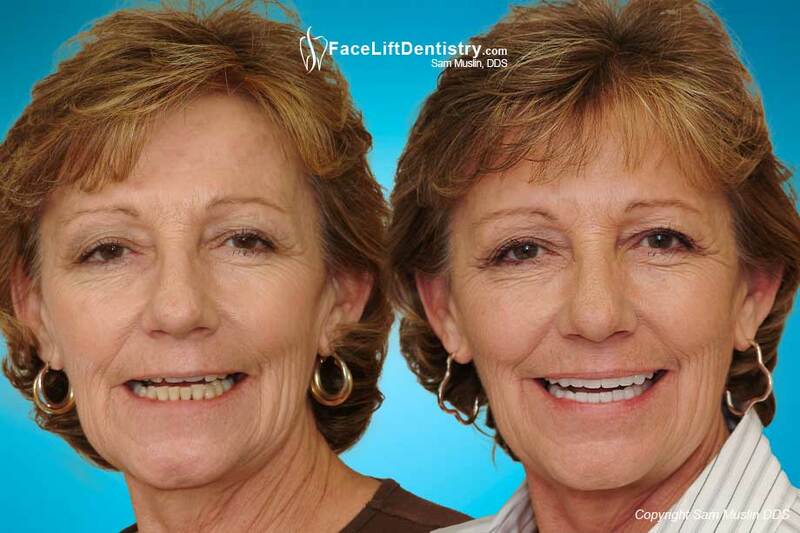 Face Lift Dentistry® Aging Reversal. 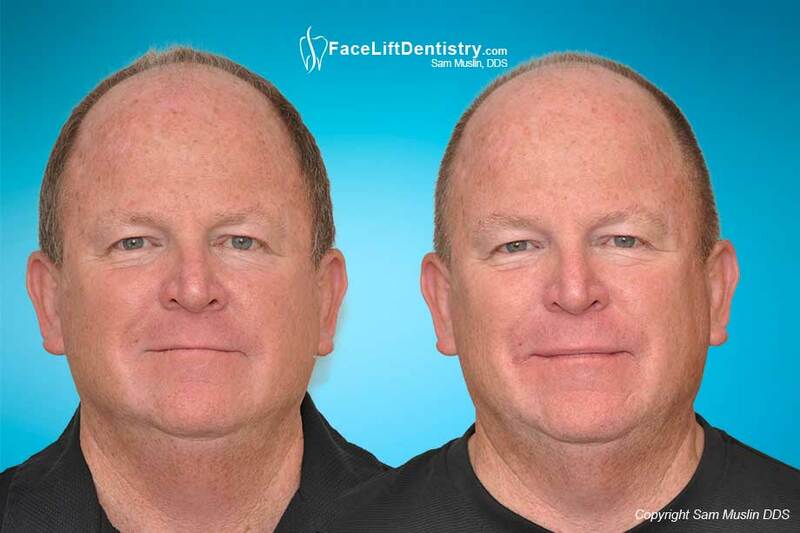 After Face Lift Dentistry® this patient looks younger, his facial wrinkles are reduced, his lips are supported and the jaw position idealized. The single most effective method of turning back the clock is by achieving the best cosmetic dentistry for the patient’s face and jaw plus the best dental health possible by reducing jaw tension and stress. Dr. Muslin calls his treatment “complete dental optimization” dentistry because every single aspect of the patient’s health and appearance are scientifically and cosmetically idealized. He studies every patient’s speech patterns, facial characteristics and designs the optimal jaw position, bite, vertical dimension, occlusal plane and facial support for his patients. As a Master of the Academy of General Dentistry, his training covers the entire spectrum of dental health care that he has taken to a new level of preventing premature aging by developing optimal facial support, Cosmetic Anti-Aging Dentistry. The patient’s that he has “idealized” have better facial support, optimal facial length, jaw position comfort and significantly less stress and tension. His neuromuscular dentistry methodology has developed into one of the most predictable treatment methods of full mouth reconstruction dentistry combined with is exclusive Face Lift Dentistry® that can be delivered very quickly and without surgery. Short yellow teeth and a worn down bite created slurry speech patterns and a short round older looking face that was completely reversed with Face Lift Dentistry®. This patient had been coming to Dr. Muslin for over 10 years for his oral health needs. While his individual teeth and gums were in good health, the wear caused by grinding had dramatically shortened his teeth and his face. This shortening was causing his jaw to slide back which threw his bite out of balance and alignment. He was very wary of actually pursuing the full mouth reconstruction that he needed to restore his bite and jaw position. 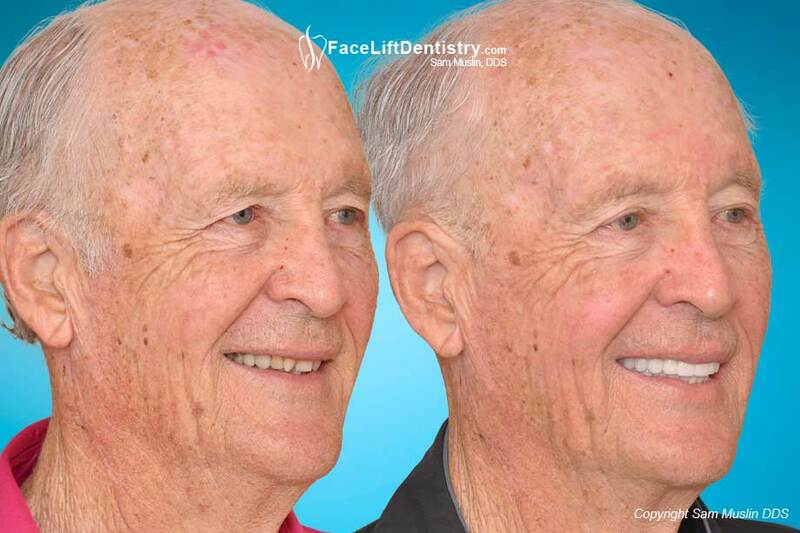 He consulted with several other dentists about the full mouth reconstruction before moving forward with Dr. Muslin’s Face Lift Dentistry® treatment. The patient said, “no other dentist has the before and after photos of their own patients that come any where near the quality of Dr. Muslin’s before and after photos”. “The quality of his work, and with so many patients letting him show their faces, convinced me to pick him”. As his teeth shortened from the grinding so did his face. This shortening can cause numerous effects such as speech problems that can sound like slurred words, an older and rounder facial shape, and jaw pain. To correct all of these issues the bite has to be fully “idealized” and balanced. Very few dentists are experts in bite reconstruction and jaw positioning like Dr. Muslin. He has been re-building the functional dynamics of his patient's teeth and bite for over 30 years without jaw surgery. He has a wonderful overbite correction method as well as a non-surgical under bite correction method. Generally, patient’s with under bites rarely get a choice of a non-surgical method. They are told it is surgery or stay the way you are. However, there is a non-surgical choice for under bite correction that has many advantages. When teeth are worn down and the jaw is out of position it can cause pain and headaches. This pain and discomfort is frequently triggered by a bite that is too short and therefore over closing. When over closing occurs the lower jaw slides back causing facial foreshortening. This condition continues to get worse every year because the teeth get shorter. Dr. Muslin can restore your bite by actually re-positioning your jaw by idealizing the bite. 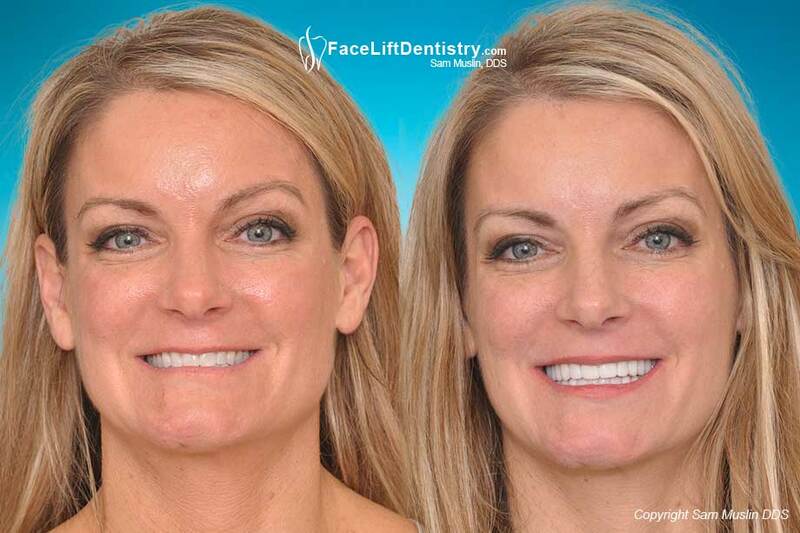 He refers to this treatment as Face Lift Dentistry® because it goes way beyond just a full mouth reconstruction and cosmetic dentistry by optimizing your jaw position and facial shape. This patient's teeth were very worn down and damaged so crowns were the best health solution. He required crowns on all of his upper teeth in order to restore the length and to balance his bite. There was decay underneath many of the old crowns that could not be detected by an x-ray or exam so replacing all of the existing work improved his health dramatically. The second step included crowns and veneers on the bottom teeth. By re-building his entire lower arch, Dr. Muslin was able to restore his teeth to the ideal height for a proper bite. 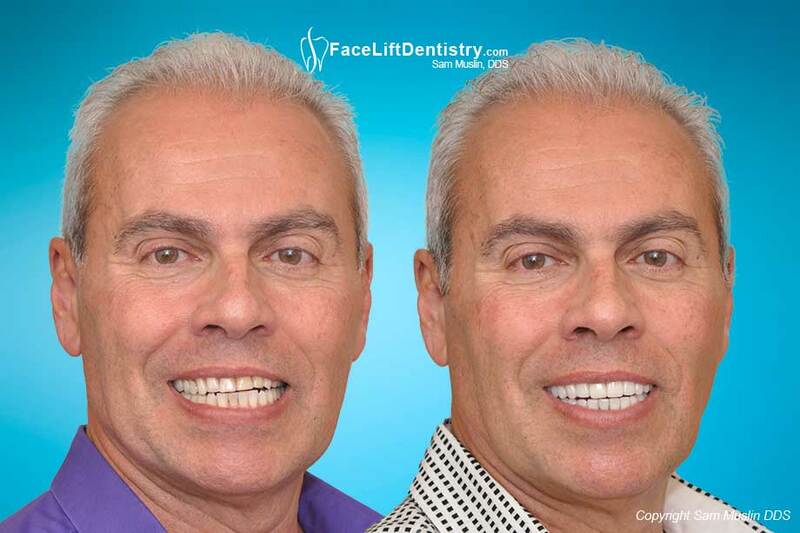 You can see when he smiles that he now shows significantly more of his upper teeth, which is a more youthful look. This is not dentistry to the stars whereby the Hollywood Stars get big fake looking white teeth. He did not want the big fake Hollywood Smile as he is a professional that wants an enhancement that improves his health and appearance without trying to make a big smile statement. He thinks that dentistry to the stars make the stars look desperate. He wanted his final look to be believable and to compliment his face but not over power it. To assure a natural looking final result, the color of the porcelain was custom designed to match his complexion. Likewise Dr. Muslin and his ceramist custom designed the shape and angle of each tooth around his facial features. This level of attention to detail and artistic styling is something you can count on from Dr. Muslin and this is why his patients say he is simply "the best dentist period". No tooth grinding or drilling. Her teeth were worn down and her face was showing signs of aging that could not be treated any other way. Her bite was correction without grinding any of her healthy teeth down. Only Face Lift Dentistry® can correct deep overbites and crooked teeth with a painless anti-aging dentistry method that is non-invasive to your teeth. She knew porcelain veneers could not help her but once she heard about Face Lift Dentistry® she flew to California for treatment. 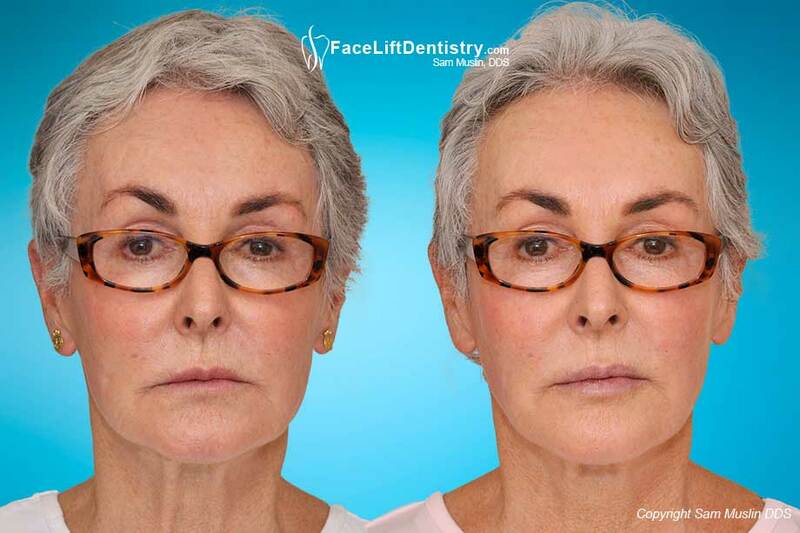 The best way to reverse the effects of aging and to lengthen the upper teeth and widen the smile, get better jaw alignment without surgery, is the Face Lift Dentistry® Anti-Aging treatment.